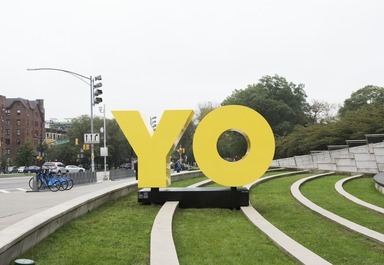 Something to Say: Brooklyn Hi-Art! 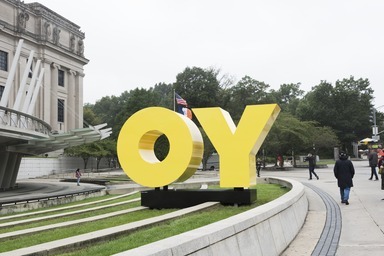 Machine, Deborah Kass, Kameelah Janan Rasheed, and Hank Willis Thomas is a yearlong activation by four Brooklyn artists of the Brooklyn Museum’s public spaces. 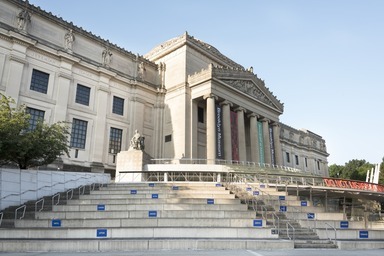 Encompassing the plaza green, steps, and promenade outside and the lobby within, Something to Say emphasizes the Museum’s role as a civic space for conversation and shared learning. 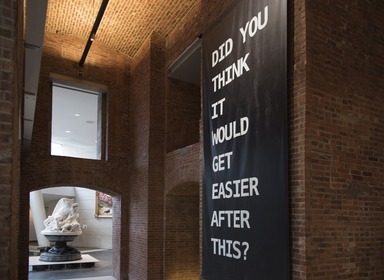 Through their text-based works, these four artists visualize language, to let us think in a different way about what words say and mean. 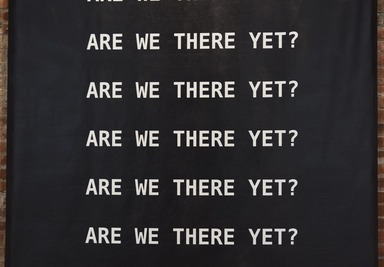 The artists engage us in topics ranging from national debates to local community issues, sparking dialogue around some of the most pressing questions of our time and inspiring us to listen, share with one another, and connect through art. 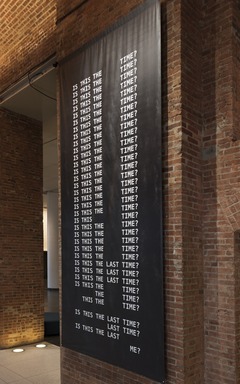 Kameelah Janan Rasheed is a Brooklyn-based interdisciplinary artist, writer, and former public-school teacher whose work often uses language to address Black subjectivity and the relationships we craft between the past, present, and future. 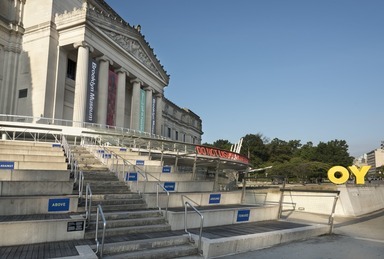 At the Brooklyn Museum, Rasheed’s two site-specific installations consider how our varied individual positions in the world—formed by the intersections of identities and relative political power—shape our imaginings of what is yet to come. 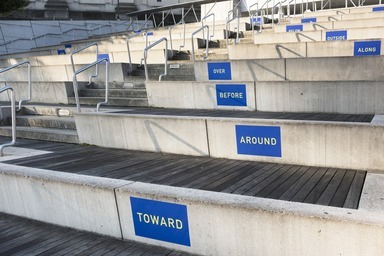 Rasheed’s second installation — I AM POROUS. 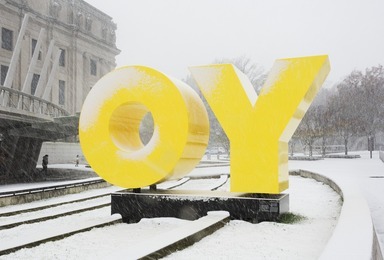 TODAY, I LEAK PREPOSITIONS. SO, I WILL ASK AGAIN, DO YOU HAVE A SIEVE? 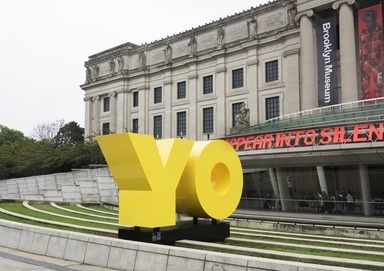 — can be found on the plaza steps outside the Museum. Love is an invitation to people to stand up and be generous every day of their lives. 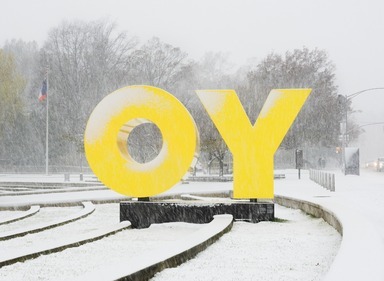 It is not an action of receiving, but rather an action of giving. 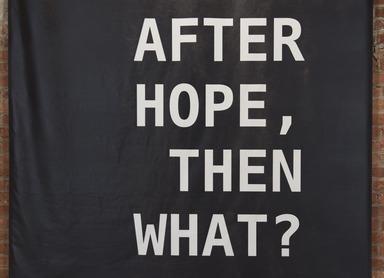 My question is what do you do to give love? How is love breaking the rules you have in your life? The Brooklyn Museum highlights the work of four Brooklyn artists with Something to Say, a yearlong activation of the Museum’s public spaces emphasizing the institution’s important role as a place for civic discourse. 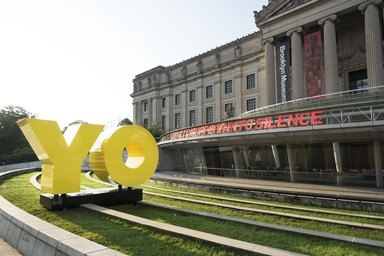 Bringing together existing works and new, site-specific commissions by Brooklyn Hi-Art! 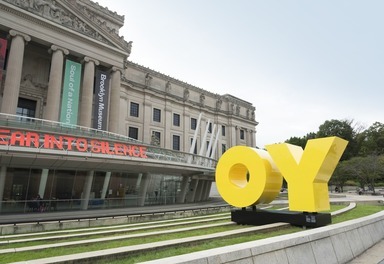 Machine, Deborah Kass, Kameelah Janan Rasheed, and Hank Willis Thomas, Something to Say explores the intersection between language and art through a series of text-based installations that activate the Museum’s plaza green, steps, and promenade outside and the lobby within. 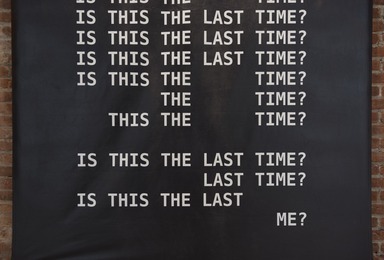 Through the use of language in their work, the artists engage us in topics ranging from national debates to local community issues, sparking dialogue around some of the most pressing questions of our time and inspiring us to listen, share with one another, and connect through art. 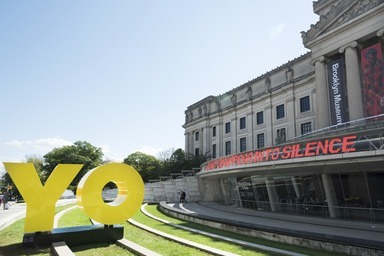 Something to Say is curated by Sharon Matt Atkins, Director of Curatorial Affairs, and Carmen Hermo, Associate Curator, Elizabeth A. Sackler Center for Feminist Art, Brooklyn Museum. 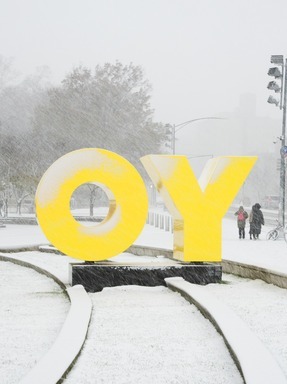 Crown Heights art collective Brooklyn Hi-Art! 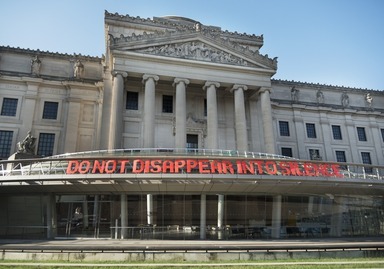 Machine (BHAM) will activate the façade of the Museum’s Martha A. and Robert S. Rubin Pavilion with one of their signature woven text works, which reads “DO NOT DISAPPEAR INTO SILENCE.” Created by BHAM co-founders Mildred Beltré and Oasa DuVerney, who often address gentrification and community-building through art-making, the installation proposes that artists and artworks can speak out for otherwise unspoken concerns and encourage the voices of silenced communities. 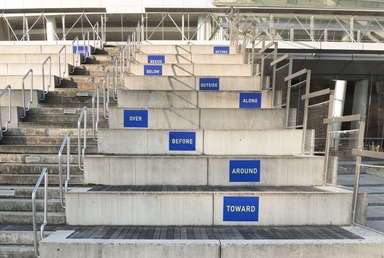 The work serves as a reminder that constructive conversations are a necessary part of a community. 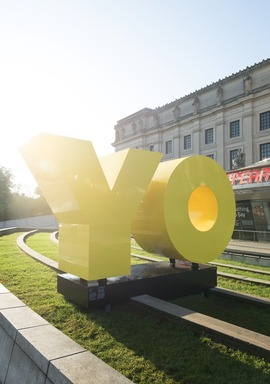 Installed on the Museum’s front plaza will be Deborah Kass’s monumental OY/YO sculpture, most recently on view on the North Fifth Street Pier and Park in Williamsburg, following its debut in Brooklyn Bridge Park in 2015. 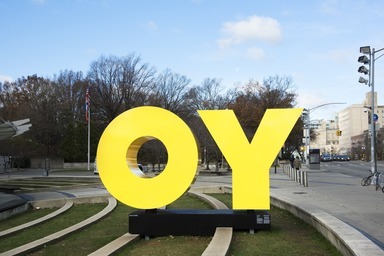 OY/YO is inspired by Ed Ruscha’s OOF (1962), Milton Glaser’s I Love NY logo (1977), and Robert Indiana’s LOVE (1966–99), and is part of Kass’s ongoing engagement with and reclamation of iconic works by twentieth-century male artists. 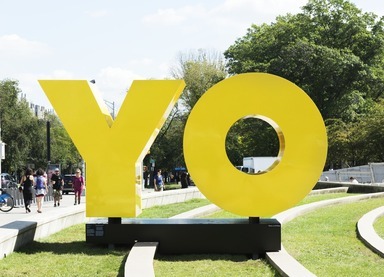 The sculpture stands eight feet tall and can be read as “YO” from one side or “OY” from the opposite side. 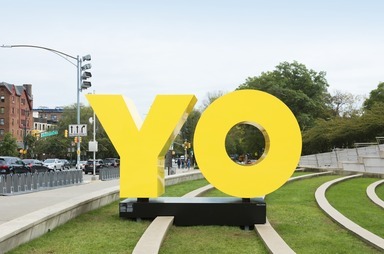 “YO” refers to both the Spanish word for “I” and to the popular slang greeting, while “OY” is a common Yiddish word expressing dismay or annoyance. 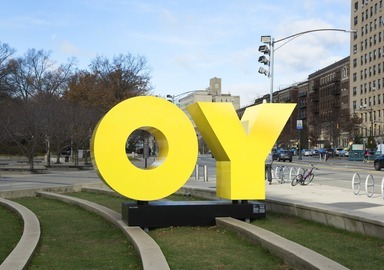 In Prospect Heights and neighboring Crown Heights, OY/YO takes on new meaning, as it speaks to the longstanding, ever evolving, and complex social dynamics between Black, Latinx, and Jewish communities in the neighborhood. 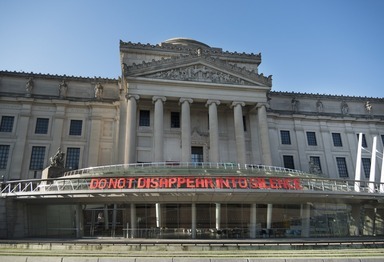 Kameelah Janan Rasheed, an interdisciplinary artist, writer, and former public-school teacher, will create a two-part installation that explores ongoing attempts to “locate self, community, and nations in an increasingly uncertain world,” in the artist’s words. 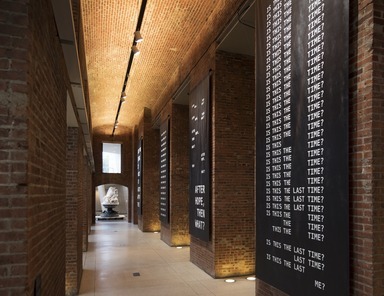 Installed on the Brooklyn Museum’s interior brick arcade, Rasheed’s indoor text work consists of a series of questions meant to serve as thoughtful conversation starters. 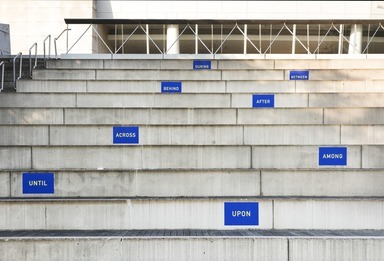 Meanwhile, on the steps near the fountain, her outdoor work engages with various prepositions that inspire reflection on time, location, and direction among visitors. 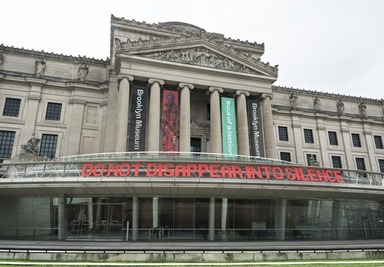 As this yearlong activation progresses, Rasheed and the Museum will engage with the surrounding community through a programming partnership with the Brooklyn Public Library. 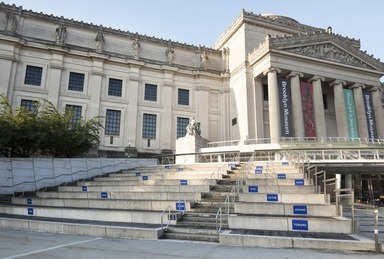 Rasheed, a former member of the Brooklyn Museum’s Education department, will organize a public reading group as part of the solo exhibition she is having at the Library starting in January 2019. 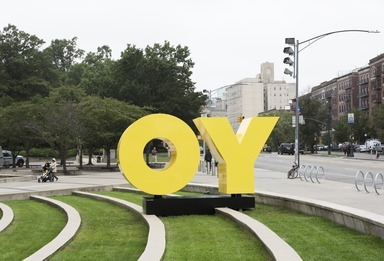 Her exhibition, organized by the Brooklyn Public Library and neatly overlapping with Something to Say, draws further connections between two of Prospect Heights’ great cultural institutions. 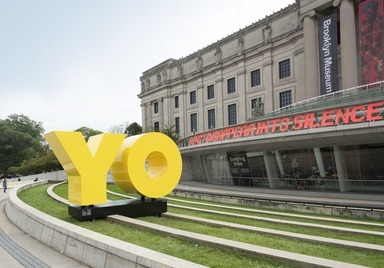 In October, Hank Willis Thomas will install a site-specific neon sculpture above the Museum’s admissions desk, welcoming visitors and reminding them of the Brooklyn Museum’s commitment to creating an inviting environment for all. 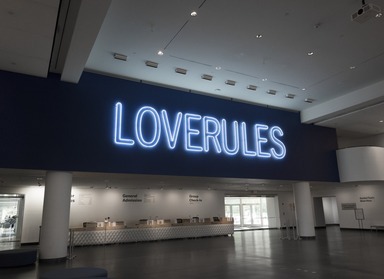 The work, Love Rules, continuously flashes various combinations of the words within it, opening it up to various interpretations, including “love over rules,” “love rules,” and “love overrules.” The poignant words were drawn from a recording of Thomas's cousin, Songha Willis, singing. Thomas found this recording a month after Willis was murdered in Philadelphia in 2000. 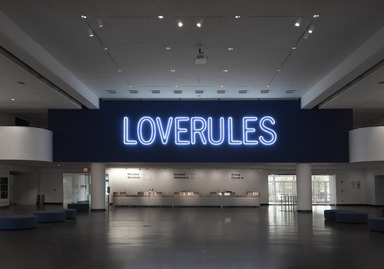 At the Museum, Love Rules reminds viewers to come together, rather than pull apart, during difficult times. 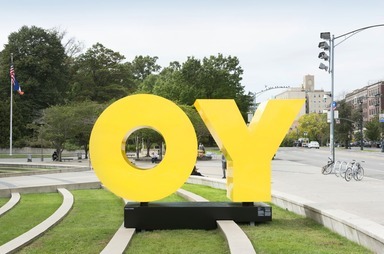 Demonstrating the integral role that community plays in Something to Say, the Brooklyn Museum will be inviting the general public to come out and experience the works on view at a community celebration on Saturday, October 6, at 11 am. 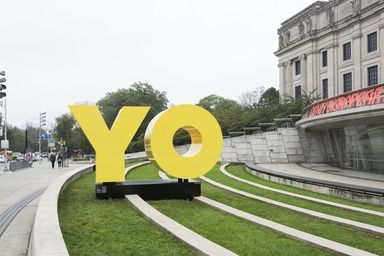 Some of the participating artists will be in attendance, engaging with the Museum’s neighbors and honoring the powerful ways in which art and language can bring people together. 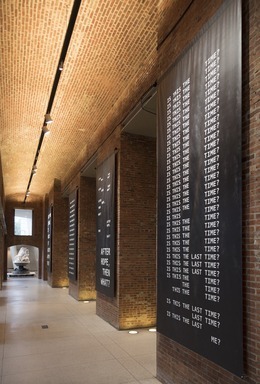 Leadership support for this exhibition is provided by Jill and Jay Bernstein. The opening events are made possible by JP Morgan Chase & CO.